A Grand Event was held on the occasion of International Women's Day by Andhrash tourism development firm, V Team, J World jointly at Gurajada Kalakshetram at Siripuram. V Team CEO Veeru Mama presided the event while AP Tourism Development firm Director P.S.Naidu, Popular Actors Sarath Kumar, Naresh, State Women Commission Chairperson Nannapaneni Rajakumari, Dynamic Lady Director Jaya B, Ganta Narayanamma Trust Chairperson Ganta Sarada, Suraksha Hospitals Director Dr Raghu, Producer Varma Raju, Director Jagadeesh Daneti, VJF Director Srinubabu, Hero Ganta Raviteja, 'Vaisakham' Producer B.A.Raju, Narayana Educational Group Director Sarani Ganta graced the event. 13 Women who showed excellence in various fields were honoured with IWDA awards. Senior Actress, Guinness Book Of World Record Holder as a Director, Smt Vijaya Nirmala is honoured with life time achievement award. On behalf of Vijaya Nirmala, Her son Naresh accepted the award. 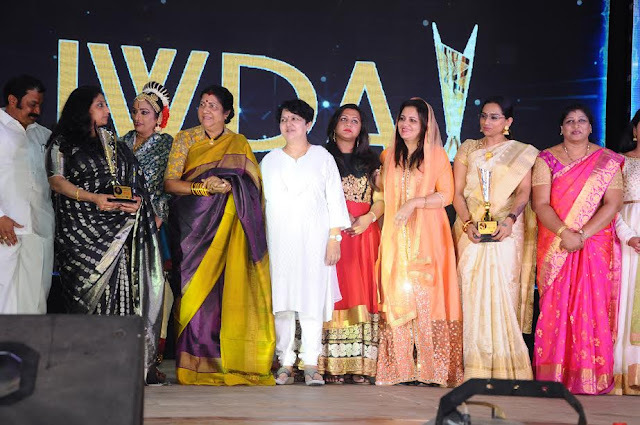 IWDA awards were presented to -Dynamic Lady Director Jaya B in Directors category, Seetha Madabhushi from US for Traditional Dance, Film Actress Sana, Padmini Kachhapi from US for Music, Nazareth Hazan from Dubai for Peace Ambassador, Social Worker Haarika Kolivelisi, Film Singer Kalpana, TV Actress Pallavi, Social Worker Kalasa Medapureddy, Marchina De Cruz for Advanced Education, Steel Plant Traffic Police G.Lakshmi, Actress Samalini Ponsika, Sridevi Varma Datla for Agriculture were awarded with VTM Lifetime achievement awards by guests. They were awarded Mahanati Savitri book along with award mementos. State Women Commission Chairperson Nannapaneni Rajakumari, " Last year I received Lifetime Achievement Award. 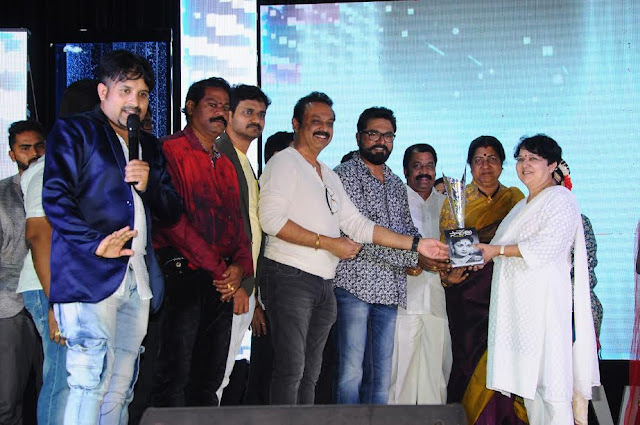 This year I am elated to present the Lifetime Achievement Award to Naresh on behalf of her mother Senior Actress, Popular Director Vijaya Nirmala. These Women who are being awarded here today stands as an example for women power and also states that Women are equal in every field." Dynamic Lady Director Jaya B, " I feel very happy that Vijaya Nirmala Garu, who is an inspiration for all of us is honoured with Lifetime Achievement Award. Happy to see Naresh garu attending this event on behalf of his mother. My happiness gets doubled to receive IWDA Award as a Director in the same event where Vijaya Nirmala Garu honoured with Lifetime Achievement Award. I feel lucky to receive this awards from my favourite persons Nannapaneni Rajakumari Garu, Sarath Kumar Garu, Naresh Garu. I shot my movies in Visakhapatnam. I will shoot my next film here in Vizag. This is a memorable moment for me to receive this award in the presence of Visakhapatnam people and so many talented women. Among all my films, 'Vaisakham' is getting very good appreciation and winning many awards." Movie Artists Association General Secretary, Vijaya Nirmala's Son Dr Naresh, " Professionally Visakhapatnam is like my mother. First shot of 'Nalugu Stambalata' in Jandhyala gari Direction was shot here in Vizag. Later my superhit films Rendu Jella Seetha, Jambalakidi Pamba, Srivariki Premalekha were shot in Visakhapatnam. Amma Vijaya Nirmala was unable to attend this event as she is not feeling well. That's why I attended this event on behalf of her. I am here today because of my mother Vijaya Nirmala, Krishna Garu, Visakhapatnam people."